NHL fans are already familiar with the HBO and Epix documentary series 24:7 Road To The Bridgestone Winter Classic, but the NHL has now advanced the concept one step further — and towards Lord Stanley. The NHL will continue to give its fans a closer look behind the scenes and the league’s locker room doors with a new TV series which will premiere tonight via Showtime. But, this time around the series will focus in on NHL clubs’ run for the Stanley Cup. The intensity doesn't stop off the ice so why should the cameras? Trying to win the hardest trophy in all of professional sports, the Stanley Cup. Showtime has even tweeted out teaser video clips and trailers leading up to the intriguing series premiere. Appears to be pretty cool, right? Also, the final season which was aired on HBO, between the Toronto Maple Leafs and Detroit Red Wings in 2014, was boring to say at the least, especially with the lack of color the then current players portrayed towards the camera. After a one year hiatus, the NHL and Epix teamed up to bring back the 24:7 series in 2015-2016. Changing networks seemed to bring some new life to the concept, as this hockey enthusiast thought the network did a solid job filming behind the scenes with the Boston Bruins and Montreal Canadiens — even if the two clubs and their players could market themselves. From the trailers above I get the impression that Showtime’s production will add some new flavor to the concept — just like Epix displayed. 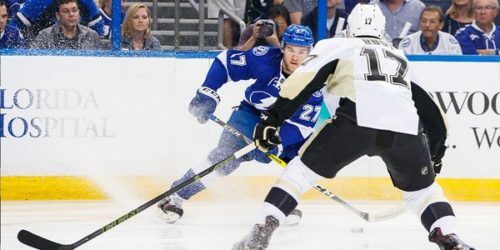 Each episode will air for a half hour, and the premiere centers in on game six from the Washington Capitals vs. Pittsburgh Penguins overtime thriller; and the Conference Finals with matchups between the Tampa Bay Lightning vs. Penguins and San Jose Sharks vs. St. Louis Blues; proceeding episodes will go behind the scenes from the highly anticipated 2016 Stanley Cup Finals. This is quite the experiment and risk for the NHL, but I have a feeling the fans will not be disappointed.